The intensive 12 month full-time professional course provides specialised training in acting for film & theatre. The classes at Lifft India Academy’s RGBAS are conducted by Prof. Ram Gopal Bajaj and his authorised trainees, in-house faculty members who passionately teach the craft and meta physics of acting through practicals, theories and exercises, dance and extensively filmed practicals. Professionals, Celebrities and Theatre stalwarts comprises the studio’s visiting faculty who share their invaluable experiences with students. A short stage play and a short film shall be produced by Lifft India Academy for each batch at the end of the course and the DVD of the same shall be presented to the students. The produced play and the film may be uploaded on Lifft India you tube channel at Lifft India’s sole discretion. The copyright of the play and the film shall remain with Lifft India Academy for perpetuity as per Copyright Act of india. 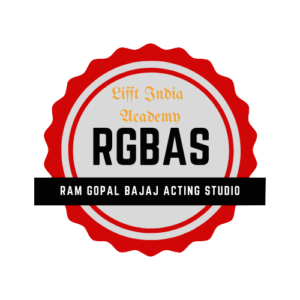 Lifft India Academy diploma bearing Ram Gopal Bajaj Acting Studio name will be awarded to all students upon satisfactory completion of the course. Accomodation/Hostel Fees: INR 10,000/- per student per month on twin sharing basis inclusive of meals. The Admission Fees is to be paid full in advance on confirmation of the admission. The admission/course fee does not include charges for hostel/accommodation/F&B/canteen. Residential service at Samparc Youth Hostel at subsidised rate of INR 10,000/- per student per month on twin sharing basis inclusive of meals can be availed at additional cost. Alternately, private accommodation in appartments near Malavli railway station can also be availed with additional charges. WARNING: Use of narcotics, drugs, cigarettes, alcohol etc is strictly prohibited in the campus and during the course period.